Slavik Markovich is a serial entrepreneur with a passion to solve hard technology problems. He is co-founder and CEO of Demisto and serves as board member and advisor to several security startups. Prior to co-founding Demisto, he was VP & CTO of database technologies at McAfee (Intel Security). He joined McAfee via the acquisition of Sentrigo, a database security startup, which he co-founded and served as CTO. 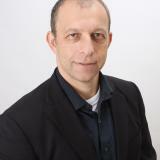 Slavik has over 20 years of experience in infrastructure, security and software development. Previously, he was vice president of R&D and chief architect at DB@net, a leading IT architecture consultancy firm. Slavik has contributed to many open-source projects and is a regular speaker at industry conferences. He holds a BSc degree in Computer Science. Check out the incredible speaker line-up to see who will be joining Slavik.